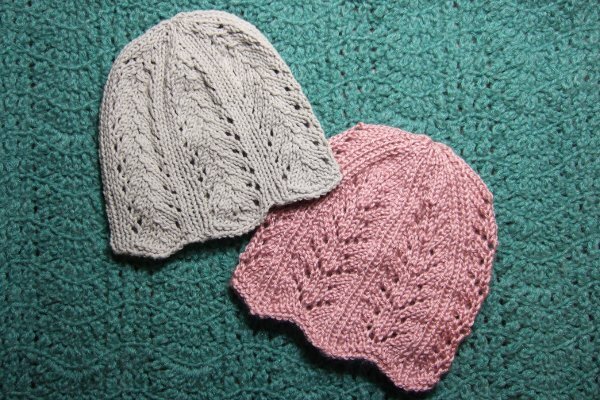 These two lace edged caps can be made in a solid color or with two colors. 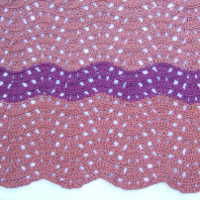 The one on the left is a madiera lace and the one on the right a scallop lace. This version of the pattern is for straight needles. For the in-the-round version go here. Cast on 85. Repeat directions between * across the row. For two colors, make color change here. Repeat rows 15 and 16 until the hat measures 5.75″ from the edge. End with a Row 16. Work Crown. Rows 5-12: Repeat rows 3 and 4 four more times. Cut the yarn with several inches to work with. With a yarn needle, pull the yarn through all the remaining loops, secure, seam side, secure and weave in end. 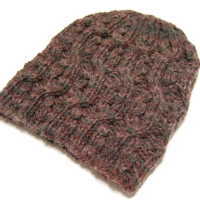 These two ribbing and lace caps are feminine yet functional. The one on the left is a feather lace and the one on the right a diamond lace. This pattern is for straight needles. An in-the-round version is available here. sssk = slip one knitwise, slip one knitwise, slip one knitwise, insert left needle into front of the three slipped stitches and knit. Cast on 85. Repeat the directions between the * across the row. 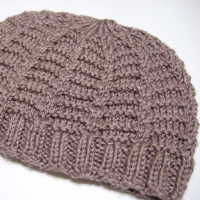 Repeat rows 4 – 7 until the hat measures 5.75″ from the edge. End with a Row 4. Cut the yarn with several inches to work with. With a yarn needle, pull the yarn through all the remaining loops, secure, seem side, secure and weave in end. 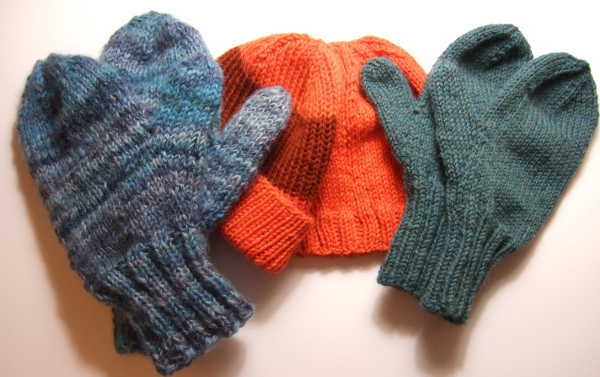 Repeat rows 4 – 11 until the hat measures 5.75″ from the edge. End with an even numbered row. For March 2013 I sent six lap blankets with the batch of items for hospice. This is made from some donated Lion Brand Homespun. The pattern is No Beginning Chain Asymmetric Shell. This was made with Jo-Ann Sensations Rainbow Boucle Multi. 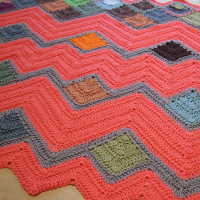 The pattern is No Beginning Chain Crazy Block Afghan. This is made from Jo-Ann Sensations Rainbow Classic. 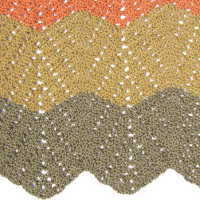 The pattern is Lacy Round Ripple Blanket. 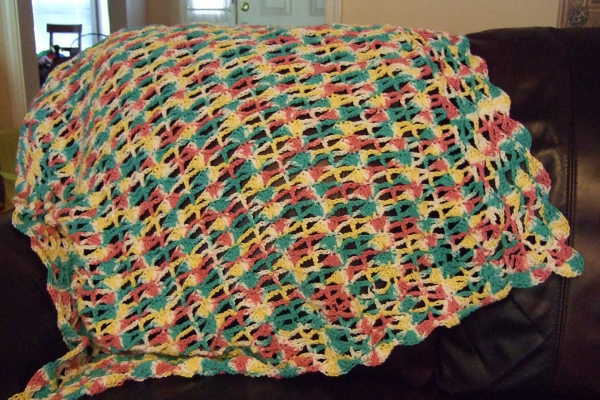 This blanket is made from Jo-Ann Sensations Rainbow Classic Pattern. 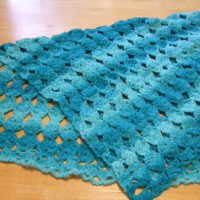 The pattern is Shell and Wrapped Stitches Blanket. 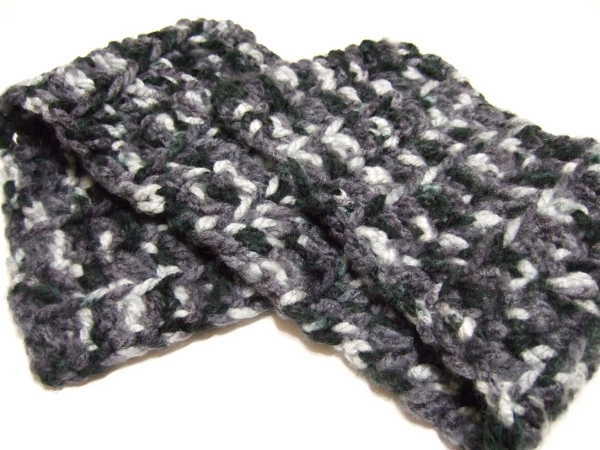 This is made from Yarn Bee Boucle Traditions. The pattern is No Beginning Chain Strawberry Lace Blanket. This is a scrap lapghan I made from worsted weight scraps I’d saved. The pattern is Mitered Squares Afghan by Chris de Longpré but I laid the squares out square rather than on the bias. 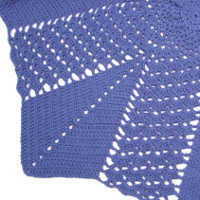 For December 2012 I sent eight lap blankets with the batch of items for hospice. This yarn is Knitting Fever King Tut, a mercerized cotton yarn. 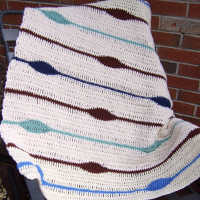 The pattern is Chevrons and Ladders Ripple Blanket. This was a stash buster I made with all my remaining Knitting Fever King Tut. The pattern is Crazy Ripple Blanket. 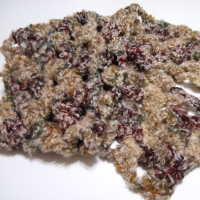 This is made from Joann Sensations Rainbow Boucle. The pattern is No Beginning Chain Egg Blanket. This blanket is made from Loops & Threads Impeccable™ Ombre. 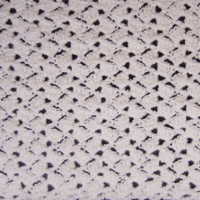 The pattern is Filet Blocks Ripple Blanket. 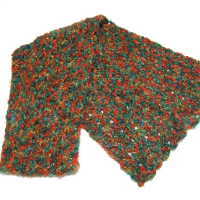 This is made from Joann Sensations Rainbow Boucle Patterns. The pattern is No Beginning Chain Granny Ripple Afghan. 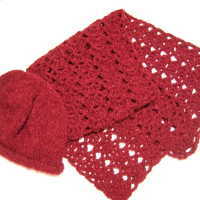 I made this one with Red Heart Soft Yarn Solids & Heathers. 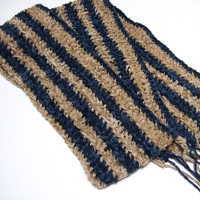 The pattern is Shell and Stripe Ripple Afghan. 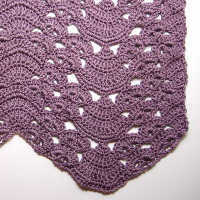 The center of this is made with Lana Grossa Niki yarn that I traded with a fellow Ravelry stitcher in California. The pattern is Repose by Carole Prior from Leisure Arts #3137, Big Book of Quick Knit Afghans. The Niki blanket was smaller than I wanted, so I improvised a pattern similar to Repose as a border on all sides and added it with Lion Brand Vanna’s Choice yarn. I had DK weight baby yarn in yellow and lavender in my stash. I used them double stranded to make Reversible Shell Baby Afghan 06-34089 from Lee Wards Complete Library of Needlecraft. I didn’t have enough lavender to make the blanket long enough, so I added top and bottom borders in the yellow in a single layer of shells. Yes, that says 2012. I really am more than a year behind posting these. 2013 was a hard year for me, and I’m sincerely hopeful that things will be better in 2014. For October 2012 I sent twelve lap blankets with the batch of items for hospice. This yarn is Knitting Fever King Tut, a mercerized cotton yarn. The pattern is Double V-stitch Ripple Blanket. This was a stash buster I made in several Aran weight scraps. The pattern is The Blanket Has Eyes. This also made from Knitting Fever King Tut. The pattern is Fans and Pansies Ripple Blanket. This also made from Knitting Fever King Tut. The pattern is Spider Lace Throw. This is made from a discontinued yarn from my stash, Caron SnoSpun. 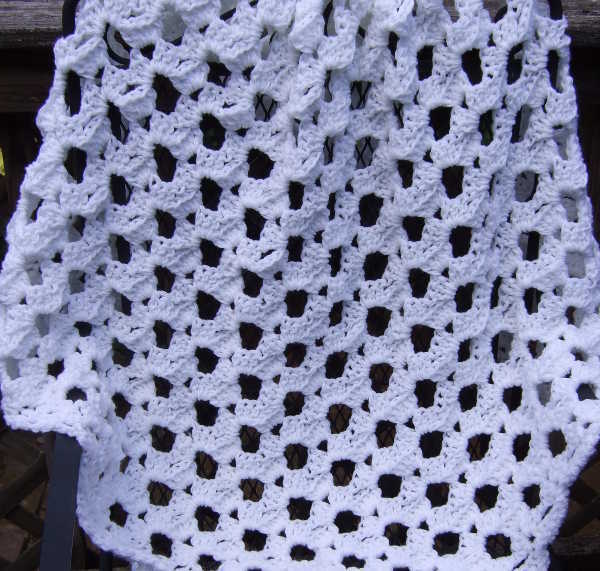 The pattern is No Beginning Chain Lacy Shell Afghan. I made this one with two stands of DK weight yarn. 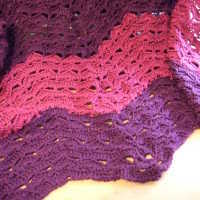 The pattern is No Beginning Chain Quick Shell Afghan. 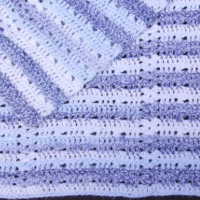 This blanket is made with Hobby Lobby I Love This Yarn! Dark Country Blue. 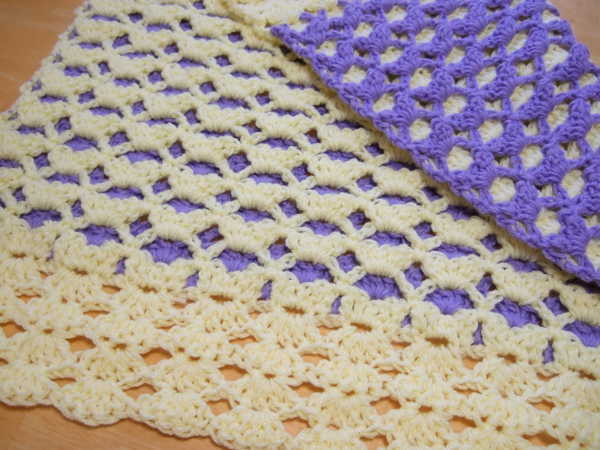 The pattern is Shell and V-stitch Round Ripple Blanket. This also made from Knitting Fever King Tut. 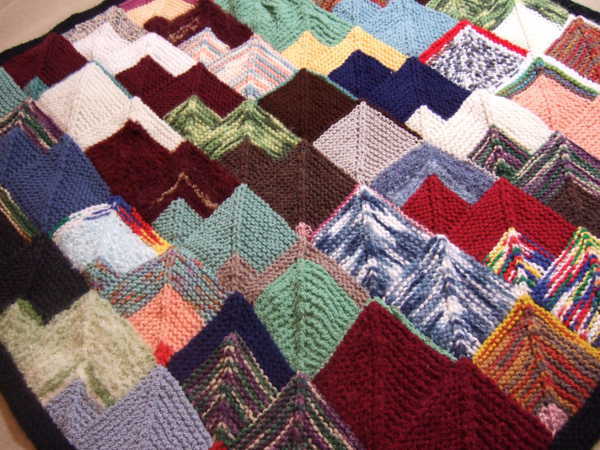 The pattern is Wavy Squares Afghan. This one is made with two strands of Bernat Softee Baby. 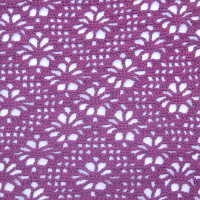 The pattern is #137 in the book The Complete Book of Crochet Stitch Designs. 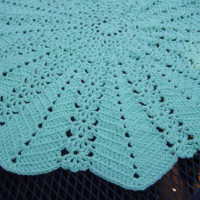 I had a spool of discontinued Peaches & Creme in my stash and used it to make Crochet Heathers Throw by Melissa Leapman. This one is made with two strands of Bernat Softee Baby. 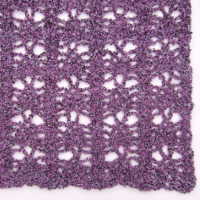 The pattern is #256 in the book The Complete Book of Crochet Stitch Designs. I used two stands of Knitting Fever King Tut to make this one. 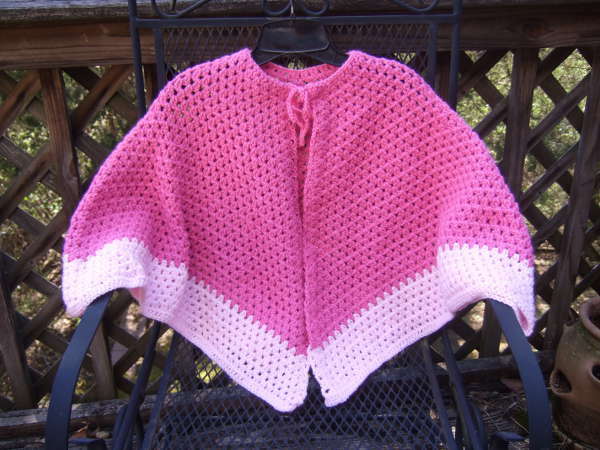 The pattern is Super Quick Throw by Marilyn Coleman. As usual, I am really behind posting this. 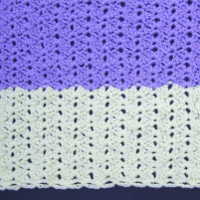 For June 2012 I sent two baby blankets and eleven lap blankets with the batch of items for hospice. These two preemie blankets are made with donated Knitting Fever King Tut cotton yarn. They are my own patterns – King Charles Brocade and Little Checks. These three lap blankets are from my own patterns. 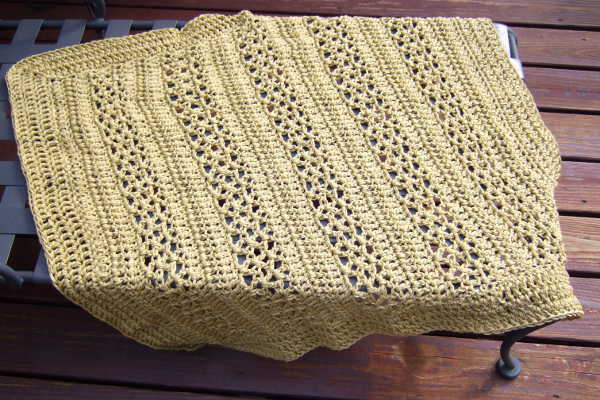 The first is made with Caron Simply Soft, Sunshine color. 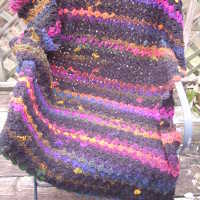 The pattern is Soft Clusters Ripple Afghan. 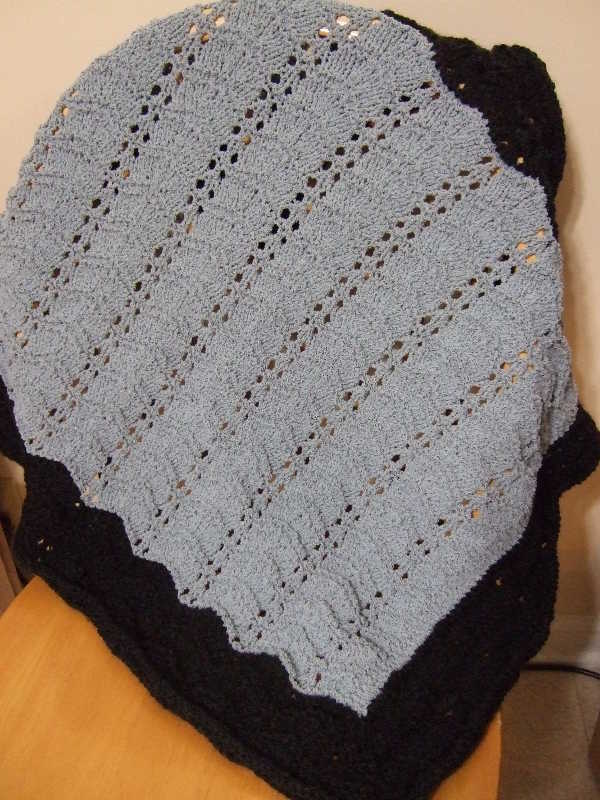 The second is made with Bernat Soft Bouclé and the pattern is Lacy Check Ripple Afghan. The third is made with King Tut Knitting Fever and the pattern is Shell and Post Stitch Ripple Afghan. These three are made from some yarn my aunt and uncle bought at a yard sale. There was no label, so I don’t know what it is. It felt like it was mostly acrylic. It had an ecru base with a variegated thread wrapped around it. The first is Lyn’s Round Ripple, the second is Delectable Shell Afghan, and the third is Climbing Shells. 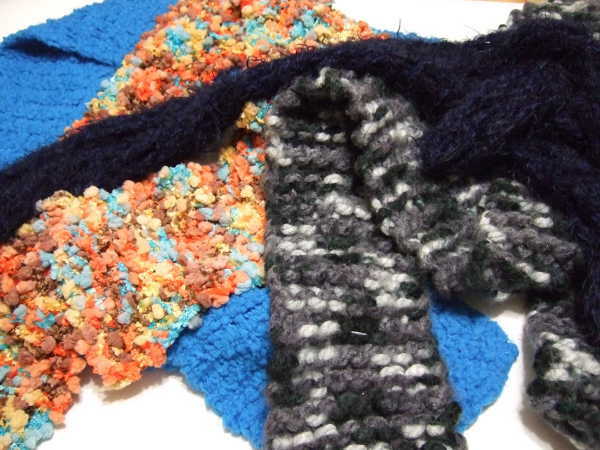 These three are made with Jo-Ann Sensations Rainbow Bouclé. The two blue ones are my No Beginning Chain Crazy Block Afghan. 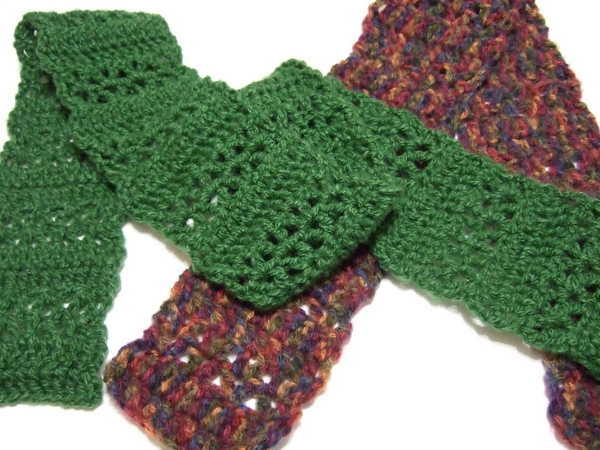 The green one is based on the Asymmetrical Shell stitch pattern from Donna Kooler’s Encyclopedia of Crochet. 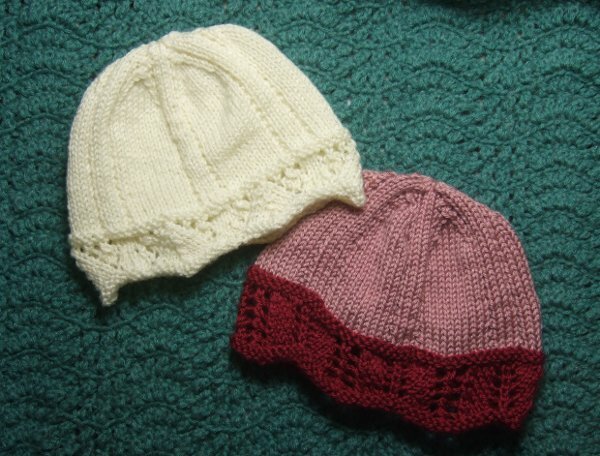 These are both made from King Tut Knitting Fever cotton yarn. The first is my Little Shell Ripple Afghan. 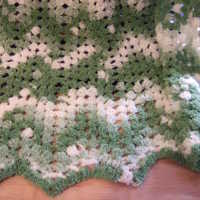 The second is Speed Hook Shell Afghan. I was very busy adding items to the March 2012 batch for my friend’s delivery to our local hospice. I contributed six lap blankets and nine preemie blankets. Other volunteers make baby hats, so I used coordinating yarn to make blankets to pair with them. This first lap blanket is from some donated Jeanne salmon colored cotton yarn and some ecru cotton I had on hand. 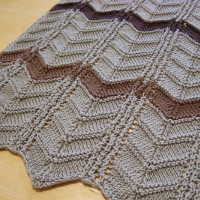 The pattern is Diamond Ripple by Anne Halliday in Leisure Arts #108214, Afghans for All Seasons, Book 2. 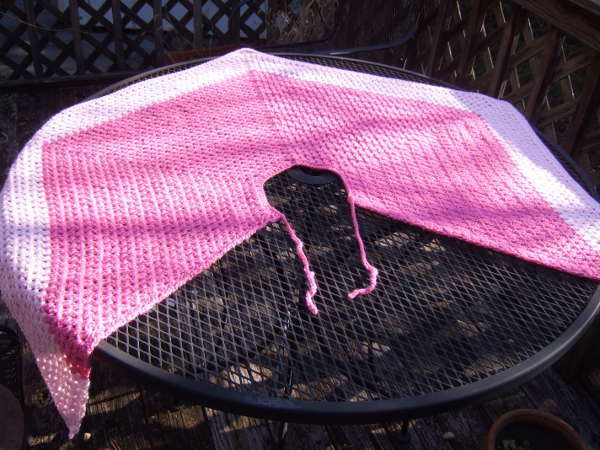 The second lap blanket is from Baby Bee Pitter Pattern yarn. I had started a baby blanket for my son, who is now nearly four, so he doesn’t need it. I finished it as a lap blanket. It is the standard feather and fan stitch. 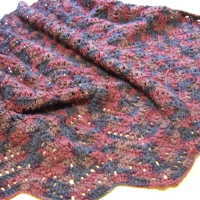 The third lap blanket is yet another one of Lyn’s Round Ripple Blankets. It is just such a fun and easy pattern. These three lap blankets are from my own patterns: Lacy V-stitch Ripple Afghan, Jacob’s Ladder Ripple Afghan and Shell and V-stitch Ripple Afghan. 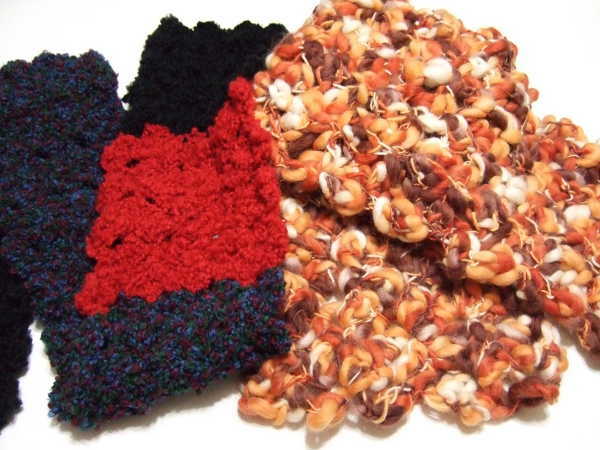 These are three little square preemie blankets made from donated King Tut cotton. 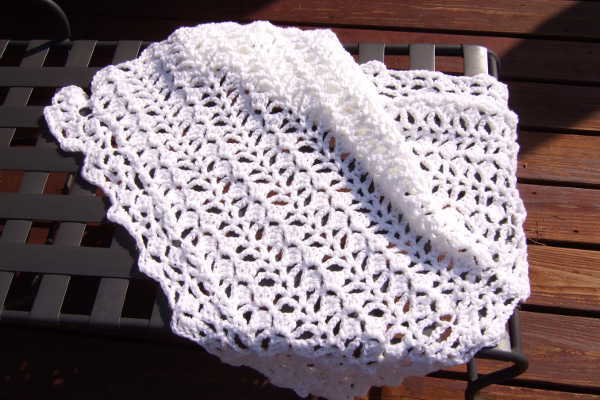 The first two are patterns I have posted: Tiffany Lace Baby Blanket and Fan Lace Baby Blanket. 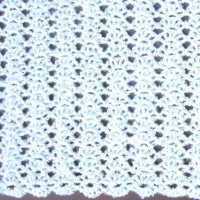 The third is an original design in Tunisian crochet. I haven’t gotten brave enough to write up the pattern and post it. I have never written down a Tunisian crochet pattern. These three preemie blankets (also in the cotton King Tut) are crochet, original designs I have posted: Ribbed Ripple Reversible Afghan, Ribbons and Lace Afghan and Eyelet Ripple Afghan. These three preemie blankets (also in the cotton King Tut) are knit, original designs I have posted: Simple Lines Baby Blankets and Wrapped Stitches Baby Blanket.